Offering kids bribes for good behavior is positively Dickensian. But there's nothing wrong with a little incentive. Fortunately, there are plenty of enticing events next week. The Rochester Museum and Science Center hosts a Polka Party and Polish Dance performance in its Eisenhart Auditorium on Sunday, April 17, from 2-6pm. One of the featured bands is The Knewz, a high-energy hybrid of the Grammy nominated Dynatones and other well-known Buffalo bands. Hopefully, they'll do for polka what the Pogues did for Celtic music. In a family-friendly way, naturally. Adult admission $7, RMSC members $5, children 12 and under free. For info visit www.rmsc.org or call 271-4320. The Seneca Park Zoo has Spring Break Camp from April 18-22. 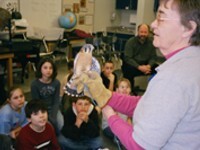 It's a series of one-day workshops for kids in kindergarten through third grade. At the Sorting Safari on April 19, kids will learn to classify animals based on whether or not they have a backbone. That system works for politicians, too. The half-day session from 9 a.m.-12 p.m. is $25 for members, $30 for nonmembers. The full-day session from 9 a.m.-4 p.m. is $40/$45. Visit www.senecaparkzoo.org or call 336-7213. The Joke Shop makes its debut at Genesee Community College's Forum in Batavia on April 21 at 7 p.m. The members of this comedy troupe are customers of Arc of Monroe County, an agency serving individuals with disabilities. Expect lots of audience participation at this free celebration, including "Laugh In" inspired dancing and the chance to share your favorite knock-knock jokes. For info, go to www.generationcool.biz or call 637-3984. For Christmas 1974, my parents gave me Watership Down; I came across my mother's simple inscription as I began reading it to my daughters recently. It's astonishingly good, a ripping epic yarn told in glorious prose with the very best kind of allegory (the kind that doesn't work too hard at being allegory). It's the story of a rogue band of rabbits in search of a new home. One theme is leadership. The smallish Hazel --- who formerly enjoyed so little stature that the Chief Rabbit called him "Walnut" --- struggles to be a leader in uncertain, and often terrifying circumstances. He tries things that work well, and things that don't. I often feel that way as a parent. My wife and I discuss strategies for dealing with things, but then reality hits, and we improvise, sometimes for the better, other times not. The other day, my middle child was being flat-out mean to her siblings, and I blurted out that if she kept it up for the next 15 years, she could be certain that they would dislike her in adulthood. As it came out of my mouth, I knew it was stupid. But try we must, trying as it may be. Watership Down is as good a book as I've ever read, with things to teach to any person willing to listen. But somehow, it feels like a parenting guide as I share it with my girls. Perhaps a bit of "tharn" --- the rabbits' fearful stupefaction --- would serve me well next time a spontaneous parenting strategy occurs to me.